CABIN FEVER. Wisconsin Life producer Erika Janik (in yellow T-shirt), of Wisconsin Public Radio, hosts a group of regional writers for a weekend workshop on writing for radio and podcasts. A series of these residencies are produced by the new Chippewa Valley Writers Guild and held at a log cabin in Fall Creek called Cirenaica. 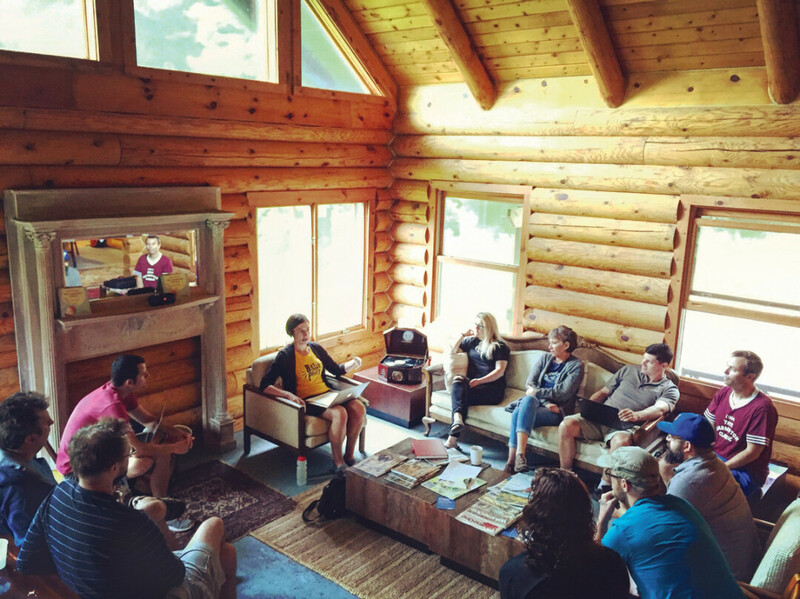 In early July I had the privilege of participating in a new writing residency at Cirenaica, a log cabin in the rolling hills of Fall Creek, where the Chippewa Valley Writers Guild is hosting its first season of weekend-long instructional workshops. From Thursday evening to Sunday morning, the cabin comes alive with serious creativity and camaraderie (not to mention amazing food and classic campfires). At each residency, 10 writers of varying abilities spend time alongside a special guest host – someone who is a great mind in his or her field – and they all work together to craft pieces in their focus areas. For this first season, weekends have been scheduled for fiction, non-fiction, poetry, memoir, and writing for radio/podcasts. Future seasons could also include things like screenwriting, writing for the stage, specific genre work, or even promoting your writing. While it’s only mid-way through its first six-session summer season, a program like this is poised to become a major jewel of the Chippewa Valley’s arts scene, and the work the Writers Guild is doing cannot be overstated. Thankfully, besides these residencies, they also produce year-round events including craft talks, readings, workshops, and more – stuff that would be fun to attend regardless of whether you’re a writer or not (and for the record I hardly consider myself a writer). It’s true that for many decades our community has had literary talents toiling away at their craft as well as frequent events to bring them out of hiding. But rarely before has an organization come out so quickly – and with such polish and promise – to create a valuable slate of offerings poised to truly leverage our community’s literary potential. You could say I had a good weekend at Cirenaica. Because out there, in those rolling hills, I saw the future.